Due to the unfortunate chair staining incident, we did not escape from our mechanically induced 11 day stay in Odessa, TX until nearly 5 PM this last Monday. Such a late departure squashed our tentative plans to head to Balmorhea State Park, but there was no way in hell we were spending another night in Odessa, so we executed our back up plan and headed 40 miles down the road to Monahans Sandhills State Park, the closest state park generally on the route towards Guadalupe Mountains and Carlsbad Caverns National Parks. 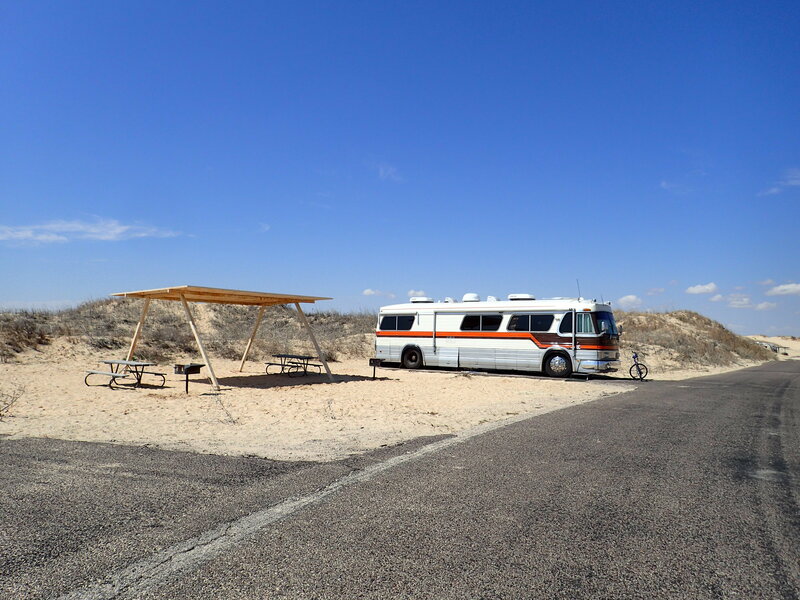 We stuck with a Texas State Park since the are very affordable, $15 a night at Monahans, and the annual pass we purchased in Galveston would eliminate the $4 per person entry fee and give us the second night in the campground at half price. We arrived after the ranger station and visitor center had closed, but as we had called ahead we knew to pull into any open site that was not posted on the reserved list at the entrance and make payment the next morning when they opened. We hooked up power and water… and almost immediately learned that I had not adequately winterized The Big Kahuna for the nearly week long freeze he experienced in the Odessa repair lot. Before we departed on our full-time journey we had nearly the entire potable water system replaced with flexible PEX piping, but a handful of the old PVC joints were still in the system, and they did not withstand the pressure of expanding frozen water. I encountered the first major water leak in the complex PVC joint at the water connection; it was cracked to the point that we could not get much water into the potable system. Unable to hook up a pressurized water source, I used an alternate connection to fill our water storage tank with the intention of using the electic pump to provide water to the bus. Unfortunately, as soon as I turned on the water pump I discovered a second crack in an elbow joint between the PEX tubing and the hard metal piping leading up to the faucets in the bus. Thus we had to spend our stay in Monahans washing dishes at the outdoor faucet and filling jugs for drinking and flushing water, but we at least had the park showers available. 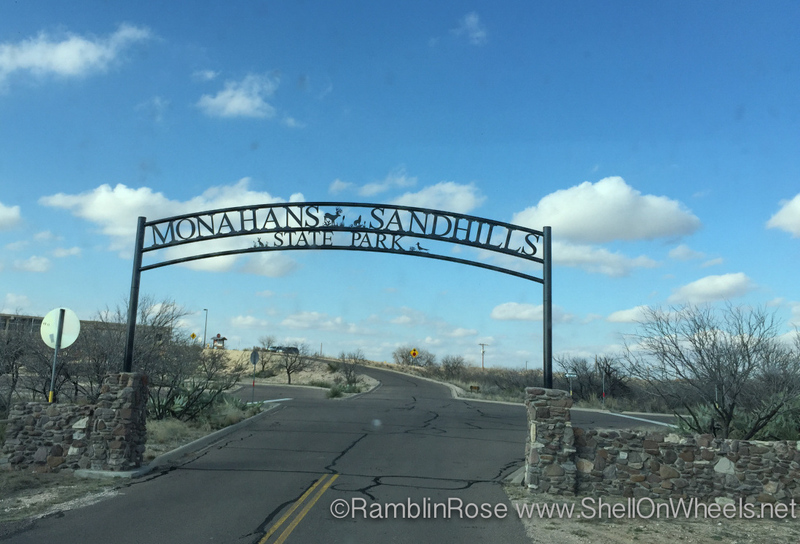 Monahan Sands is a 3800 acre park with extensive and massive sand dunes rising up to 80 feet tall. They are the primary draw for the park; Texans and other people without access to snow can come here and actually sled down the dunes. 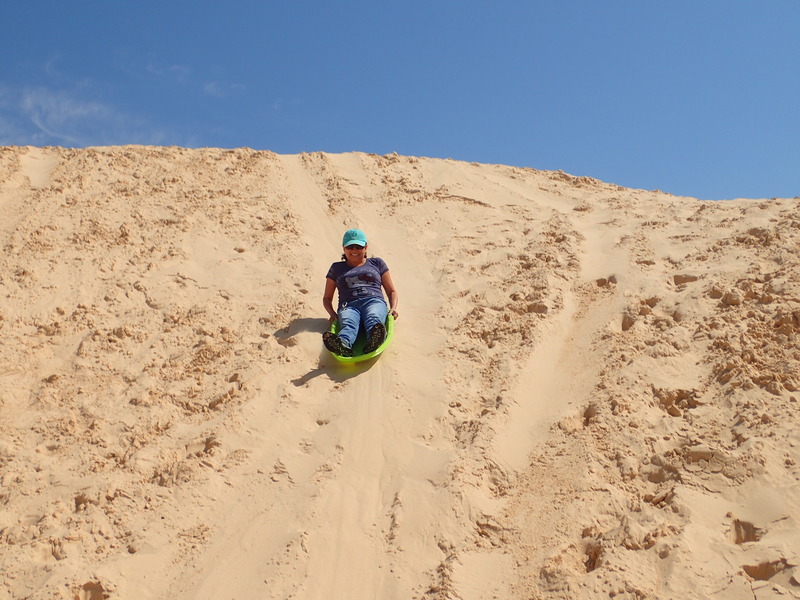 We bought a plastic toboggan from the visitor center and spent part of the afternoon laboriously climbing these over sized sand hills and sliding down at frightening speeds. Fun for an afternoon, but until they install some sky slope style lifts, this is likely to be our only visit to Texas dune country.